Until February 25 only! 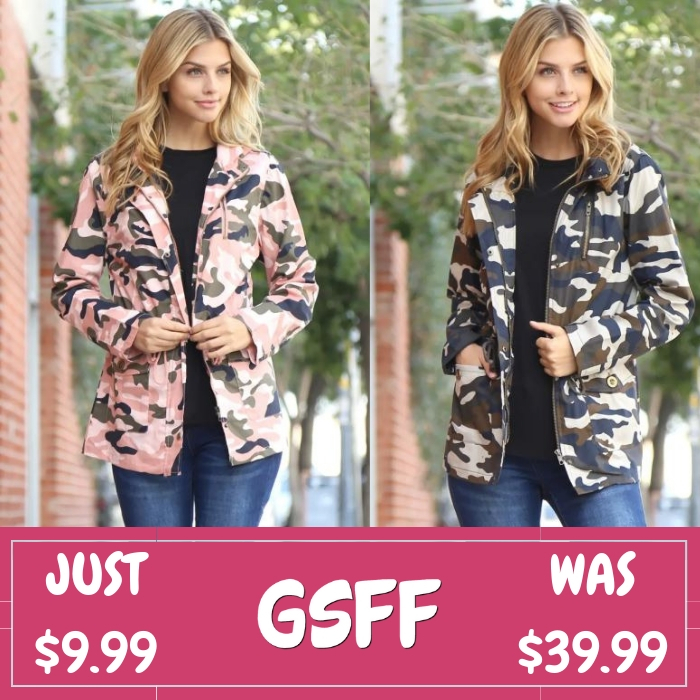 Hurry over to Jane where you can score this Lightweight Camo Jacket for just $9.99 down from $39.99 PLUS FREE shipping! A hooded camouflage jacket featuring a snap button down, hidden zipper closure, and front pockets. Perfect with basic tees underneath with distressed skinny jeans for a stylish look. Denim Jacket Just $19.99! Down From $55! Shipped! This deal expires today! At Jane, you can score this Calvin Sherpa Lined Denim Jacket for just $19.99 down from $54.99 PLUS FREE shipping! We are head over heels in love with this new Calvin Sherpa Lined Denim Jacket! It has so many fun details that I’m sure you’re gonna love, from the embroidered floral design on the shoulder, to the trendy denim fabric, to the ultra soft sherpa lining, how can you resist? This jacket is soft, cozy, and comfy, making it a must have in everyone’s closet this season! Wear it with your favorite booties and you’re sure to love the way you look and feel!